The classification report visualizer displays the precision, recall, F1, and support scores for the model. In order to support easier interpretation and problem detection, the report integrates numerical scores with a color-coded heatmap. All heatmaps are in the range (0.0, 1.0) to facilitate easy comparison of classification models across different classification reports. The classification report shows a representation of the main classification metrics on a per-class basis. This gives a deeper intuition of the classifier behavior over global accuracy which can mask functional weaknesses in one class of a multiclass problem. Visual classification reports are used to compare classification models to select models that are “redder”, e.g. have stronger classification metrics or that are more balanced. The F1 score is a weighted harmonic mean of precision and recall such that the best score is 1.0 and the worst is 0.0. Generally speaking, F1 scores are lower than accuracy measures as they embed precision and recall into their computation. As a rule of thumb, the weighted average of F1 should be used to compare classifier models, not global accuracy. Support is the number of actual occurrences of the class in the specified dataset. Imbalanced support in the training data may indicate structural weaknesses in the reported scores of the classifier and could indicate the need for stratified sampling or rebalancing. Support doesn’t change between models but instead diagnoses the evaluation process. Visual classification report for classifier scoring. Classification report that shows the precision, recall, F1, and support scores for the model. Integrates numerical scores as well as a color-coded heatmap. Should be an instance of a classifier, else the __init__ will return an error. If classes is None and a y value is passed to fit then the classes are selected from the target vector. Specify a colormap to define the heatmap of the predicted class against the actual class in the classification report. Specify if support will be displayed. It can be further defined by whether support should be reported as a raw count or percentage. Outer dictionary composed of precision, recall, f1, and support scores with inner dictionaries specifiying the values for each class listed. Renders the classification report across each axis. 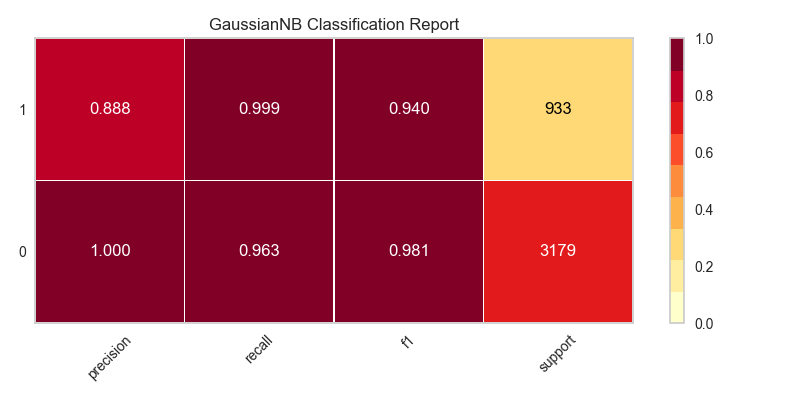 Generates the Scikit-Learn classification report.